Morgan Stanley analyst Katy Huberty wrote in a note to clients issued yesterday (via Fortune) that U.S. consumers are expect to buy more iPhones in the first calendar quarter of 2012 than even the holiday quarter this year. This is noteworthy as the holiday quarter has traditionally been Apple’s strongest three-month sales period. Not even the two recent Samsung television commercials (here and here) that poke fun of line waiters seem to be slowing the iPhone momentum (unless you believe a YouGov survey, chart included below the fold). 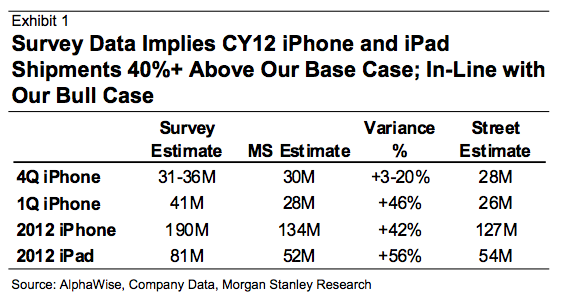 Huberty is now projecting CQ4 iPhone sales anywhere from 31 to 36 million iPhones versus the previous model calling for 30 million units (Wall Street: 28 million). For the first quarter of the next year, Huberty is projecting an astounding 41 million units based on last week’s comments from AT&T and an Alphawise survey conducted for Morgan Stanley the week after Thanksgiving. If (in the unlikely event) Apple were to reduce its iPad 2 from $499 to $399, the note continues, the company has a shot at selling some 90 million units worldwide in 2012, roughly 10 million more than its suppliers have reportedly been asked to build. The figure is assuming the 27 percent of U.S. consumers planning on buying a tablet next year (versus just eight percent this year) and a four percentage points iPad market share loss due to Amazon’s $199 Kindle Fire tablet (though it was described by J.P. Morgan analyst Mark Moskowitz as “a gateway drug” for the iPad). Summing up, should those projections turn true (and Huberty is one of the better analysts), the Cupertino, California-headquartered gadget maker could sell 270 million iPhones and iPads throughout the next year. Adding the iPod touch into the mix (the survey doesn’t take the device into account) is likely to boost sales of iOS devices in 2012 north of 300 million units. Samsung’s snarky television commercials poking fun of Apple are working, a YouGov survey indicated. 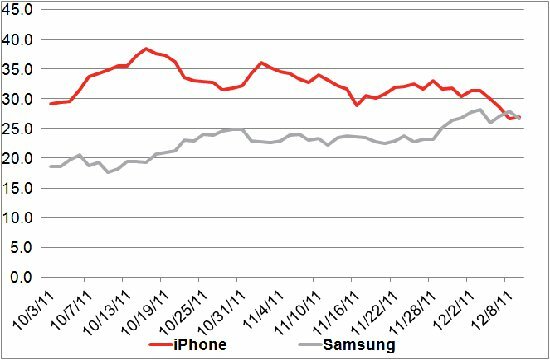 The two adverts released November 22 and December 1 that ridicule line waiters while promoting Samsung’s Galaxy SII smartphone appear to have sent the iPhone’s consumer perception in the U.S. (adults 18+) into decline into while boosting Samsung’s perception, which surpassed iPhone last week.